I drag Madeleine back to the Isabella Plantation in Richmond Park to take evening shots of the flowers, which are at the height of their bloom. The gardens BTW celebrate their 50th year. Located in a beautiful woodland, Isabella houses a most excellent collection of azaleas, including the National Collection of 50 Japanese azalea varieties introduced to the West around 1920 by the famous plant collector, Ernest Wilson. 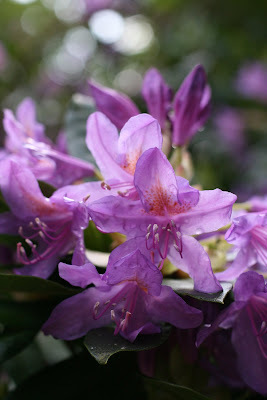 Rhododendrons, camellias, and magnolias thrive under a mature woodland canopy with many other acid-loving plants. There are several ponds and trees for Madeleine to climb as she does today and yesterday. It is the kind of thing one plans to visit all year but reallly the best time is now until early June and then it is over. Usually we miss it but this year twice already and maybe again too. Madeleine agrees to always hold my hand and notes "don't be silly dad" when I suggest one day she might choose otherwise. I ask Madeleine what the most important thing in life is? She says "parents" but I hear "parrots" (English accent) and we break-up laughing at this mis-understanding.